Work for a Salmon Hatchery! Aquaculture combines man-made facilities and science in an effort to increase the amount of marine animals and plants in the ecosystem. In Alaska, the main focus of aquaculture is salmon hatcheries. These hatcheries produce about 1.5 billion smolt, which result in about 30 million salmon – the majority of the salmon that we eat. The goal of the Alaskan aquaculture movement is to maintain natural habitats, improve the health of salmon runs, supplement wild runs, develop larger fish, and to help boost the profits of the billion dollar fishing industry. It is a cool gig that operates year round. Most aquaculture jobs are available during the busy, summer fishing season. And there are plenty of entry-level positions. The State of Alaska, private non-profits, and private individuals provide the most aquaculture jobs. Theses jobs will take you to some of Alaska’s most pristine places – Bristol Bay, Yukatat, Cook Inlet, Kodiak, Copper River, or Prince William Sound. 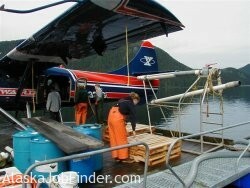 You may live in a quaint coastal town or you may travel on float planes or boats to remote aquaculture hotspots. Almost all aquaculture specialists start out as fish technicians. Fish technicians work during egg take, which occurs when salmon return to their homes. Some of these salmon are caught for their egg and sperm. During this process, fish technicians take on the resume-building roles of fish killer, fish crowder, fish bonker, and egg rinser. Don’t let the titles scare you. Aquaculture tends to have about a 50% return employee rate and on average fish technicians make about $1,600 per month with room and board provided if they live remotely. Fish Culturists work in labs. They monitor computers and lab equipment to make sure the aquaculture process is on the right track. Every aquaculture camp needs a fish biologist who has a university degree in fisheries management, wildlife conservation, ecology, or other related field to manage the process. There are few openings for these year round, high paying careers. The aquaculture job hunt should begin mid winter, although many job hunters don’t find jobs until mid summer, when extra hands are needed. Working with a small crew in remote corners of Alaska can create exceptional friendships. It’s a great little fishing industry niche that pays quite well. In the Members Section of AlaskaJobFinder we provide you some great tips and strategies for getting aquaculture jobs in Alaska. We also profile the different aquaculture operations and a number of them post their aquaculture job openings on AlaskaJobFinder.